While the league’s best team, Orlando, lost their first game this week at home, the odds-on favorite to win the league at the beginning of the season (Arizona) was able to get back to 0.500 in beating them and, along with San Antonio, seem to be making a case for a second tier to emerge in the fledgling league. After showing signs of life in recent weeks, Memphis and Atlanta continue to bring up the rear, while Birmingham and San Diego participated in one of the best games so far this season. A lot of what goes into this algorithm is the preseason odds to win the AAF (via MyBookie.ag), but the results of the first six games for each team are weighed in considerably and increasingly dissipate the aforementioned priors. We cannot promise that the inputs today will be the same inputs later in the season, given the nature of having only 24 games to go off of, but we will be transparent about our process as always. Please tweet at @PFF_Eric and @BenjaminBrown22 if you have any questions about this rankings today or moving forward. We did not print a spread pick last week, although on the PFF Forecast and through Twitter we intimated that San Antonio (+2) and Birmingham (+6) were good plays. Totals have appeared to have settled in the 35-45 range, after opening the season above 50 in each game. Unders are 14-10, going 2-6 over the last two weeks, and the home-field advantage that was discussed at length after Week 1 has all but gone away, with road teams having won 11 of the first 24 matchups so far, which is more than the historical rate for NFL and college football. Championship futures are available at some shops, so we’ve also accompanied these rankings with our odds, derived from 10,000 simulations using this ranking algorithm and other game-level variables. Saturday night was a tough game for Garrett Gilbert, who was accurate on just 27-of-48 passes, suffering from four drops and throwing one pass away in the process. His 5.6 yards per pass attempt were almost two yards worse than any other figure he’s posted so far this season. They are still the clear and unequivocal favorite to take home the first-ever AAF title but will need to take care of business in Atlanta next week. After visiting the league’s worst two teams in Atlanta and Memphis the next two weeks, it’s pretty likely that they will play at home for three consecutive weeks prior to the league’s championship game (now in Frisco, Texas), an outcome that those of us that like efficient football will gladly welcome. The Commanders never should have been underdogs in Atlanta, and they showed that by winning their third road game in a row (out of four consecutive road games). While Kenneth Farrow has carried their offense for much of the season, it was their defense and the efficient play of Logan Woodside that carried the day against the Legends. Coverage is the second-most important variable in all of football, and San Antonio has the best grade there in the league. With a game lead on the rest of their division, and a division title warranting a home playoff game in the first round, the Commanders are the second-most likely team to win the inaugural AAF crown, and certainly a team to look out for. After a couple of losses in a row and the playing of quarterback musical chairs, one thing that continues to stick for the Iron: They will be in contention come season’s end. After showing really well defensively the first four weeks, they’ve allowed 60 points the last two contests, and have fallen to second-worst as a unit in terms of our grading. They still have some good personnel in the mix, though, as Aaron Adeoye earned five pressures in San Diego, while both corners, Jamar Summers and Bradley Sylve secured big interceptions. The former interception occurred when the Iron were reeling, having surrendered a two-score lead, and propelled them back into control of a game they eventually won. They’ll likely need to go on the road in the first game of the playoffs, against an Orlando team that handled them in their first matchup, so we’re not very long-term bullish on Birmingham moving forward, despite their resurgence last Sunday. The Hotshots finally got out of their slump Saturday night in central Florida, beating an Orlando team on a late touchdown run by Jhurell Pressley, who along with Tim Cook and Justin Stockton, generated 124 yards after contact on the night. Three Hotshot defenders generated at least five pressures against the Apollos, while middle linebacker Steven Johnson secured an interception, a pressure, eight tackles and four stops in the winning effort. It is an uphill battle for Rick Neuheisel’s bunch, with Arizona facing a solid San Diego team next week before having to go against San Antonio, Birmingham and San Diego again to close the season. If they can win enough games to get into the playoffs, they should be a threat. Despite being competitive in all but one game, the Stallions finally registered their second win on the season and find themselves at 4-2 against the spread. Josh Woodrum has quietly graded as the second-best passer in the AAF and is a big reason why despite their record we are high on the Stallions. Sixth in yards per attempt at 6.7, Woodrum has made his living between the numbers on intermediate routes. Woodrum hasn’t been helped much from his pass-catchers as Salt Lake currently has the second lowest yards after the catch per reception in the AAF. Salt Lake is now the best overall defense according to PFF grade. Their pass-rush and coverage units have graded well and are at the top in both pressures and pass breakups. San Diego lost a thrilling shootout game to Birmingham on a game-winning field goal. Having one of the more volatile performances you will see from a quarterback as Mike Bercovici averaged 9.1 yards per attempt, completed exactly 50% of his attempts (four drops) with a few big-time throws but tough turnovers. If Bercovici continues to look downfield, opportunities will come. 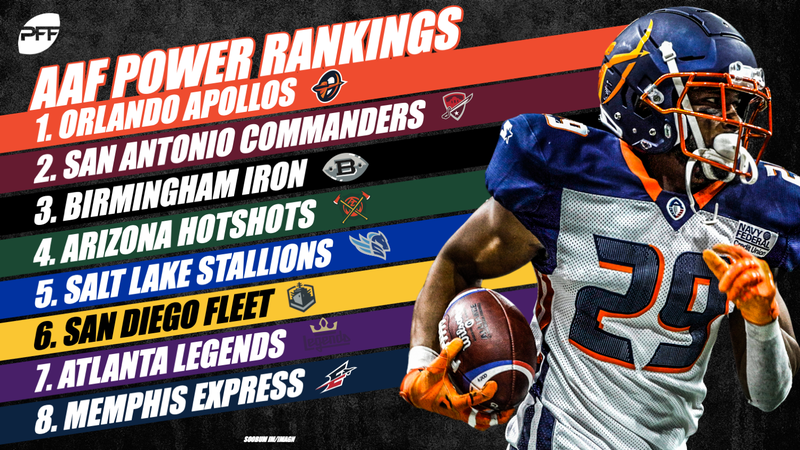 The Fleet defense grades as a top three unit with the best pass-rush in the AAF. Damontre Moore needs no introduction at this point but Alex Barrett has also played well opposite him and recorded nine pressures in their loss to the Iron. At 6.6% chance to win the title, the Fleet have their work cut out for them with three straight road games before a potential win-and-in game against Arizona to wrap up the regular season. The Hotshots failed to live up to the expectation of being a favorite, getting rolled by San Antonio at home on Sunday. This was one of the more mispriced lines of the AAF season and a clear overreaction to a solid two-game stretch by Atlanta. It leads into the question of how much is home-field advantage worth in the AAF with initial reviews saying not a whole lot. Aaron Murray came crashing back to reality with his worst passing performance to date. Murray has had very limited to absolutely no success throwing the ball downfield and with 11.3% of his attempts traveling 20-plus yards downfield, he has an adjusted completion percentage of 21.4% with a passer rating of 44.3. Defenses are able to load up and stop the dink-and-dunk game with no real threat of a pass being completed over the top. Facing off against an Orlando team looking for a rebound game, any number smaller than a touchdown dog seems like way too low of a price on Atlanta this weekend. The lowly Express who find themselves at 1-5 suddenly became a lot more intriguing with the addition of Johnny Manziel. Not a lot has gone right for Memphis and being all but eliminated from playoff contention, the opportunity exists for Manziel to see playing time right away. Zach Mettenberger, the other, other injured quarterback, has graded well and clearly isn’t the problem in Memphis. With only 51% of his dropbacks coming from a clean pocket, he has led the AAF in adjusted completion percentage at 84.6%. There is no question that Manziel is talented but is he even an upgrade over Mettenberger? The Express are all in trying to square up the most important position on the field which will serve their long term success well.